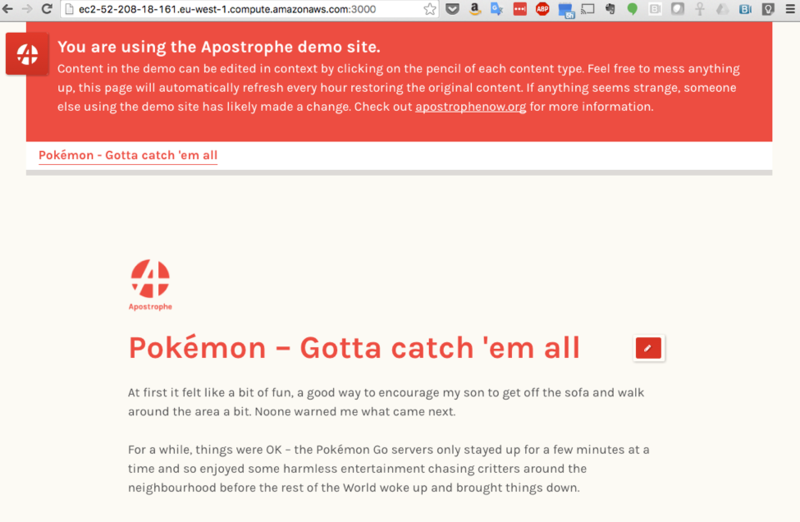 Apostrophe is a Content Management Systems that&apos;s designed to build content-driven web sites. Because of their ease of use, Apostrophe is built upon MongoDB and Node.js. 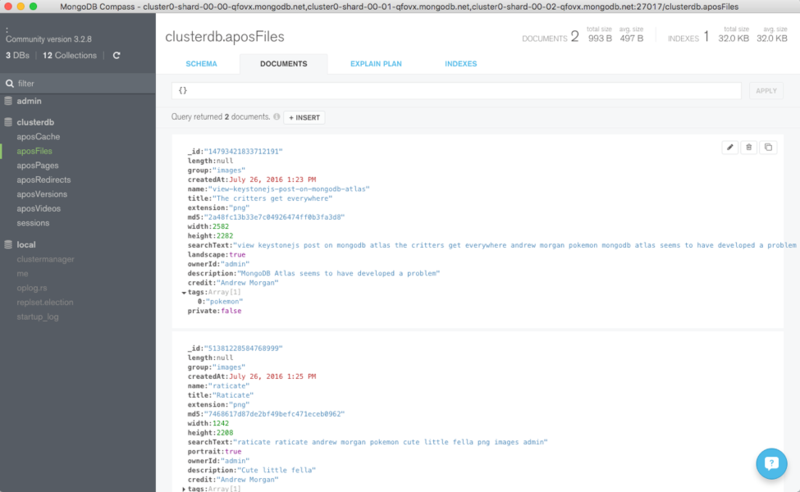 This post explains why MongoDB Atlas is an ideal choice for Apostrophe and then goes on to show how to configure Apostrophe to use it. MongoDB delivers flexible schemas, rich queries, an idiomatic Node.js driver, and simple to use high availability and scaling. This makes it the go-to database for anyone looking to build applications on Node.js. MongoDB Atlas provides all of the features of MongoDB, without the operational heavy lifting required for any new application. MongoDB Atlas is available on demand through a pay-as-you-go model and billed on an hourly basis, letting you focus on what you do best. Like Apostrophe, MongoDB Atlas is a natural fit for users looking to simplify their development and operations work, letting them focus on what makes their application unique rather than commodity (albeit essential) plumbing. 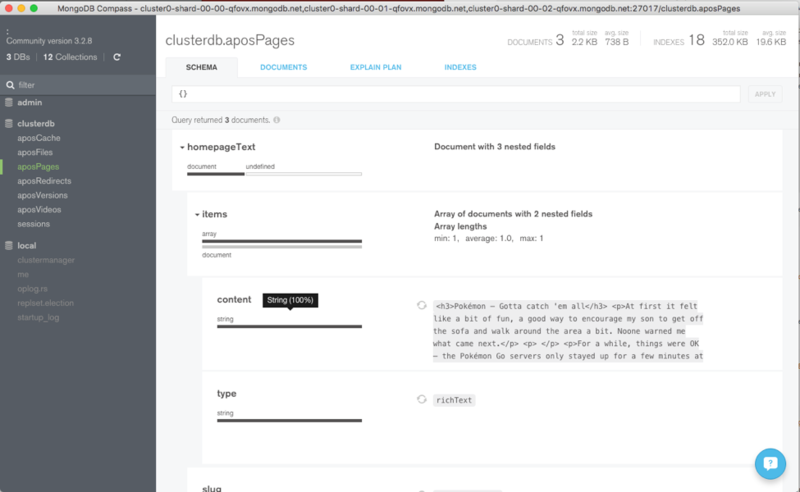 Before starting with Apostrophe, you should launch your MongoDB cluster using MongoDB Atlas and then (optionally) create a user with read and write privileges for just the database that will be used for this project, as shown in Figure 1. 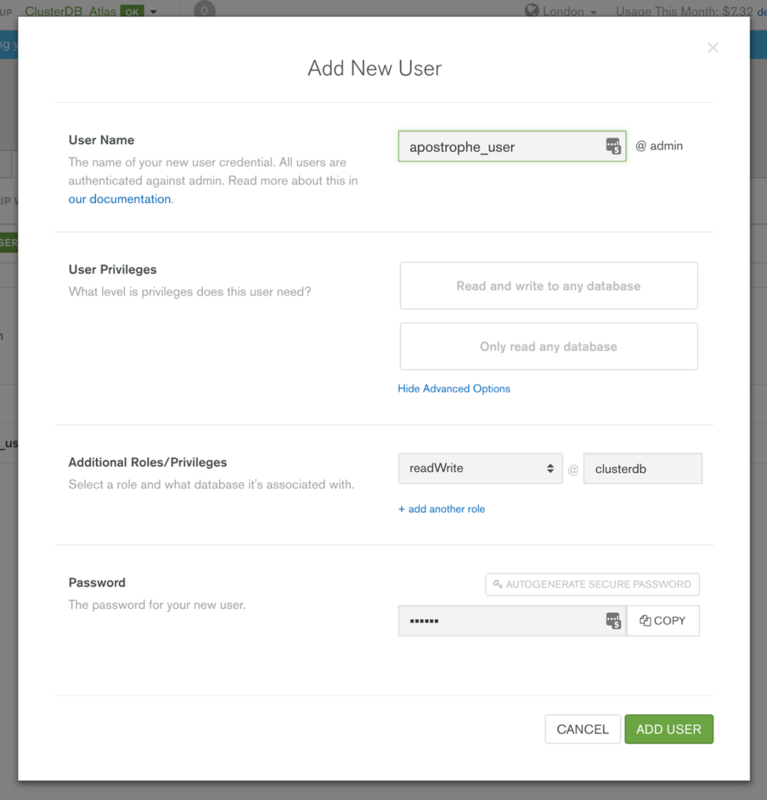 You must also add the IP address of your application server to the IP Whitelist in the MongoDB Atlas security tab. Clients connect to Apostrophe through port 3000 and so you must open that port in your firewall. Browse to the application at http://address-of-app-server:3000 as shown in Figure 2 and then login using the username admin and the password demo. Now, go ahead and add some content (Figure 3). 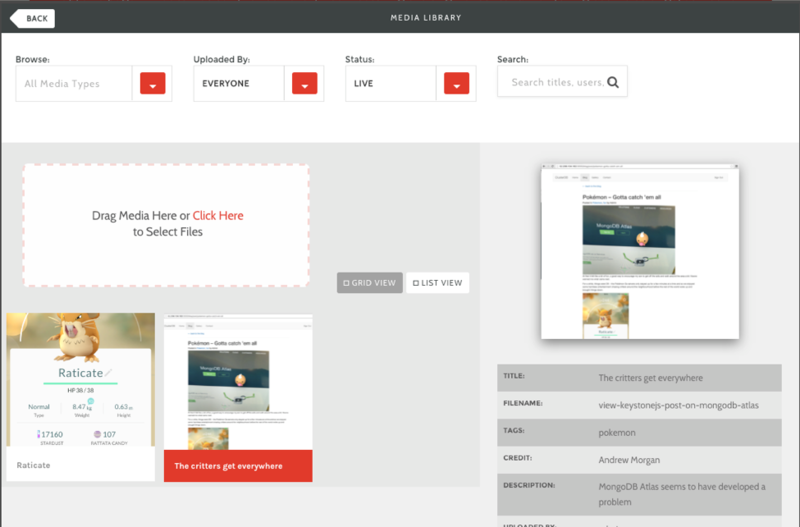 Upload some images as shown in Figure 4. To visually navigate through the schema and data created by Apostrophe, download and install MongoDB Compass. 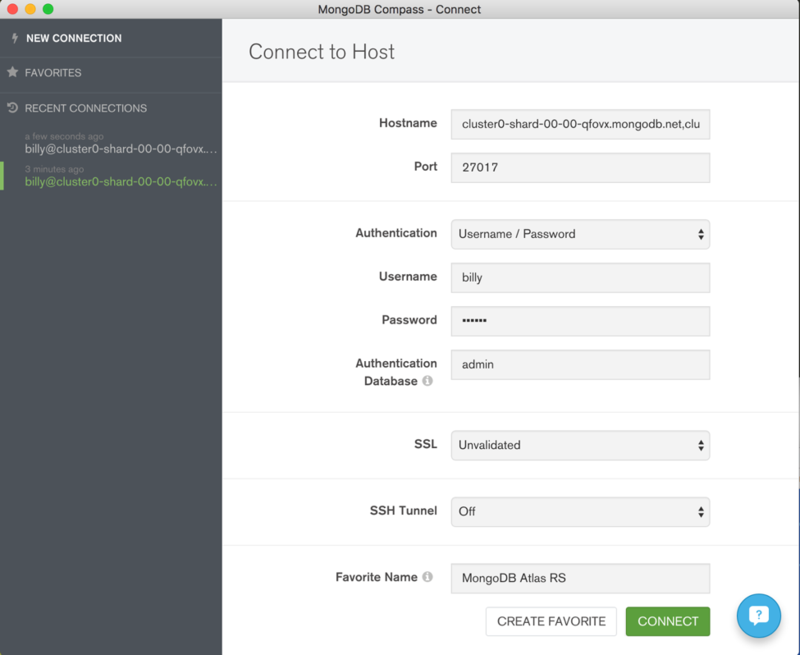 Use your MongoDB Atlas credentials to connect Compass to your MongoDB database – Figure 5. Navigate through the structure of the data in the clusterdb database (Figure 6) and view the JSON documents (Figure 7). While MongoDB Atlas radically simplifies the operation of MongoDB there are still some decisions to take to ensure the best performance and reliability for your application. The MongoDB Atlas Best Practices white paper provides guidance on best practices for deploying, managing, and optimizing the performance of your database with MongoDB Atlas. The guide outlines considerations for achieving performance at scale with MongoDB Atlas across a number of key dimensions, including instance size selection, application patterns, schema design and indexing, and disk I/O. While this guide is broad in scope, it is not exhaustive. Following the recommendations in the guide will provide a solid foundation for ensuring optimal application performance.